Australian soils are often described as ancient weathered soils, poor in nutrient and often have very little organic matter. Here on the Rock Farm, we take it to another level, with our Ordovican shale bedrock often just below the surface of our thin gravel based lithosols. There is an old adage that states ‘if you want to run ten sheep, you feed the sheep until you can run ten sheep’. This means that the food you feed your sheep becomes the manure that increases your soil fertility until you can run ten sheep. In essence, your sheep become a vital part of the composting cycle where the imported food is converted to fertilizer. 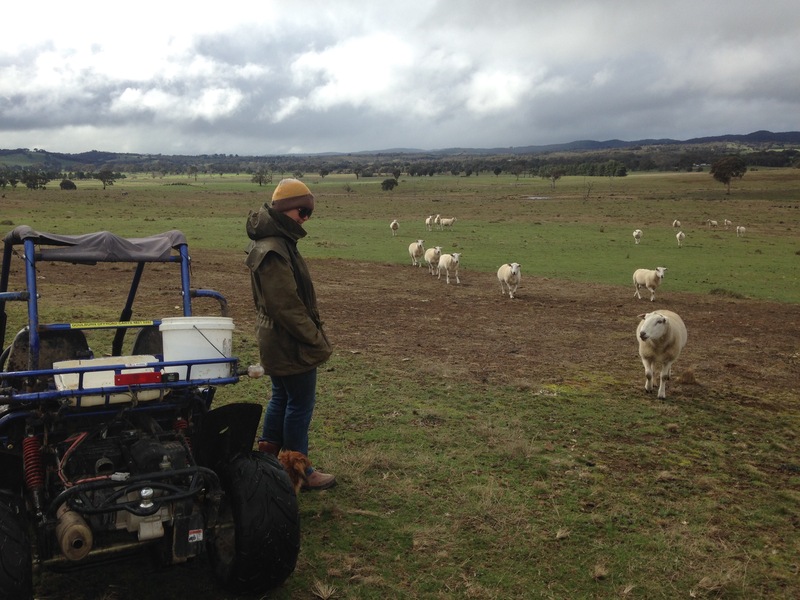 And when you feed your sheep, mustering becomes a whole heap easier, as they come running to you! In this good wet winter, our problem isn’t enough food. There is plenty of bulk in the native grasses at the Rock Farm, but like Burke and Wills, I didn’t want our sheep starving on full bellies. 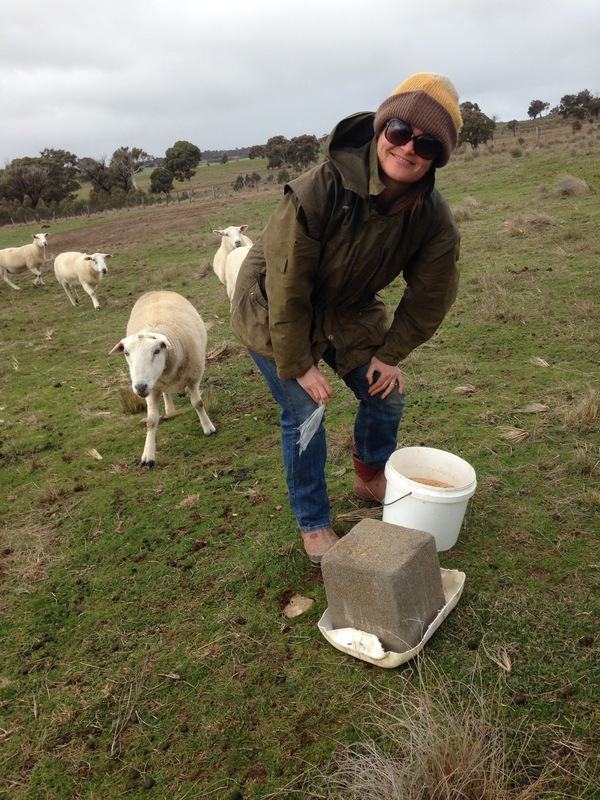 With mineral deficiencies common, we are experimenting with a salt lick or mineral supplement block. 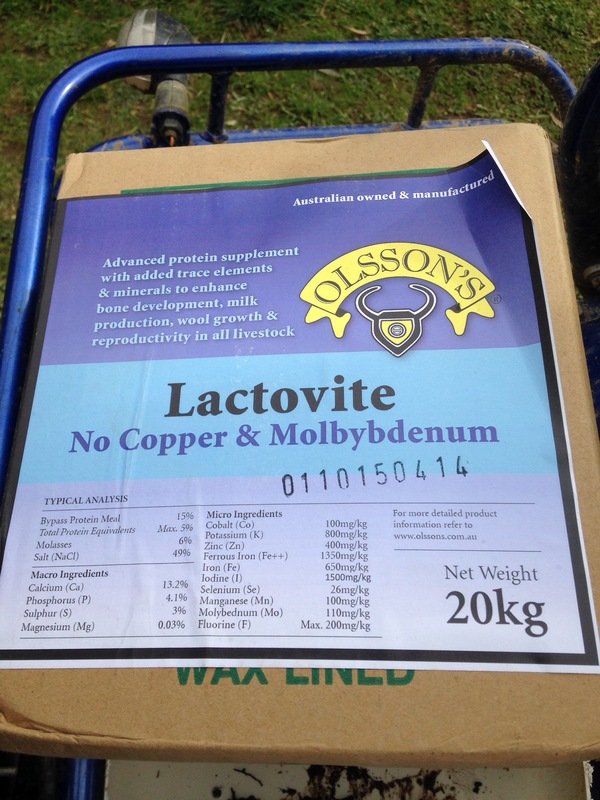 With the sheep and horses running in the same paddock, we had to pick a mineral supplement that doesn’t contain urea. Most cattle and sheep supplements contain urea. Urea is toxic to horses, due to the differences in the gut. The urea provides nitrogen for the the microflora that lives in the ruminant (cattle and sheep). Horses only have one stomach (like us), and the urea may cause non-protein nitrogen poisoning. 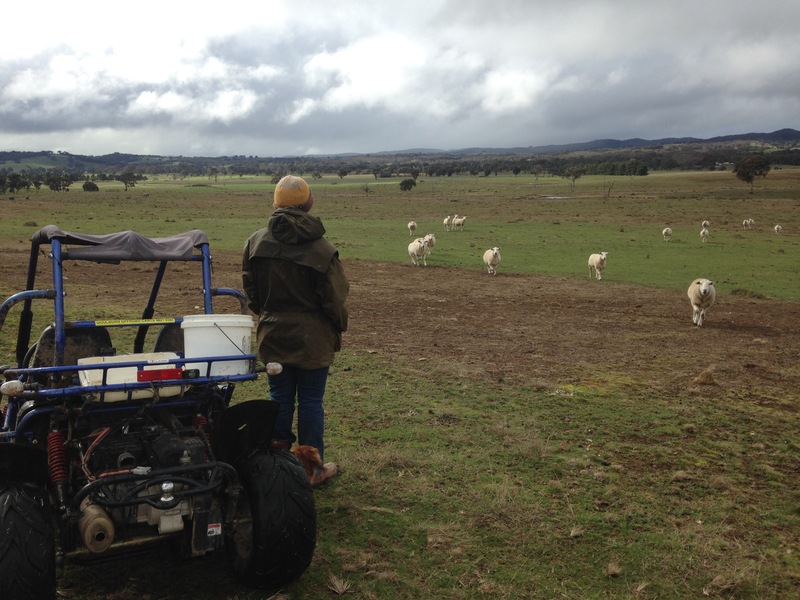 We put the lick out in the paddock, and soon had the sheep wandering up to check it out. Actually they were checking out the bucket of oats – and looking for a feed. 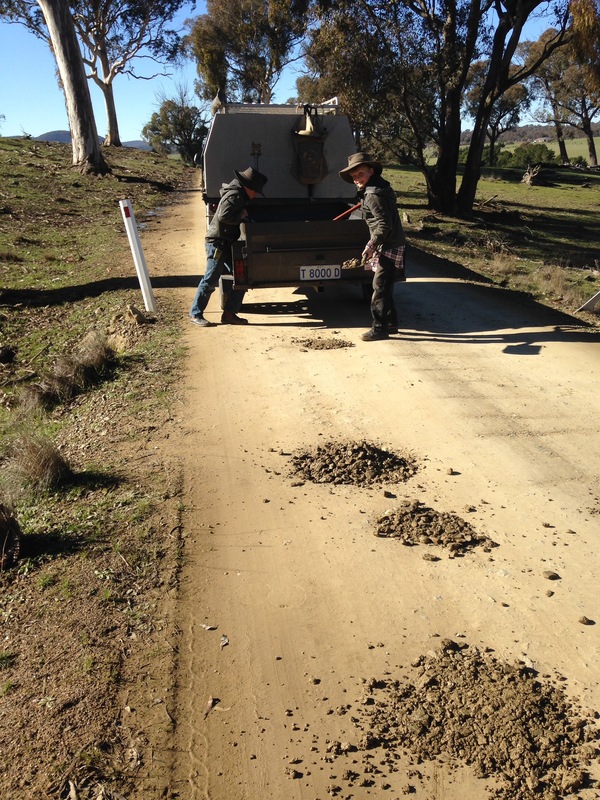 The benefits of bucket mustering are obvious when they come when you call! This is obviously a very broad solution to a specific problem. With a bit more time and effort, we could put out a range of different specific minerals, and see which ones they take. This will indicate strongly which minerals our land is deficient in. We hope to get to this point in the future, but in the meantime, the scatter-gun approach will have to suffice. As an aside, you can see the bands of dead grass in this photo. The ground has been sprayed in preparation for planting of trees in spring. Whilst I am generally against chemical use on the paddocks, this is the most effective way to establish trees. We spread the oats around the lick. 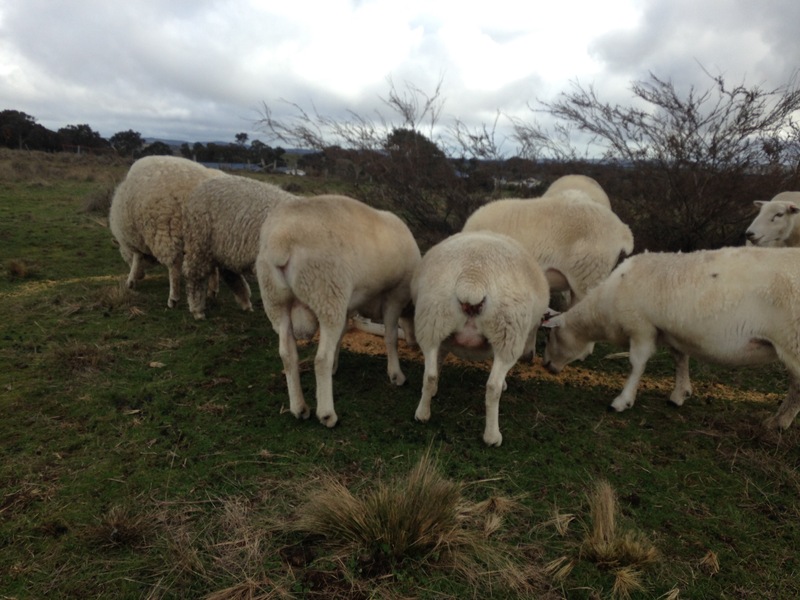 The sheep crowded around it – and devoured the oats. I am not sure how long it will take them to work out the benefits of the mineral supplements now available to them. We have gone back a couple of times over the past week to encourage the sheep to check out the lick. I don’t know how successful this will be – but we will see. Hopefully the sheep will seek out any mineral deficiencies they crave. Any minerals their bodies don’t require will pass through the sheep and become part of the mineral bank in our soil. It will take us time to work out what the best way to manage our resources on the Rock Farm… but that is what it is all about. Living on the Rock Farm brings us so much pleasure and enjoyment that we often forget some of the other disadvantages of living at the end of a gravel road. 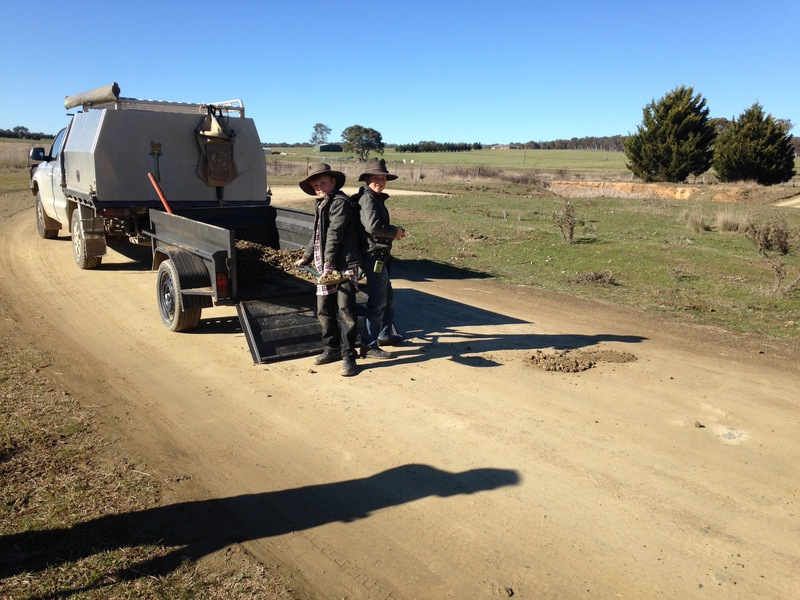 Whilst our gravel road provides us with a quiet refuge from the pace of modern society, it is not on the local Council’s regular maintenance schedule. And whilst the recent wet weather has been welcomed on the Rock Farm, it has wreaked havoc with our road. With the pot holes reaching wheel swallowing size, it was time to call in a favour and recruit a new Road Gang. Our neighbour David owns a tractor and has a gravel pit on his place. David’s tolerance of pot holes is even less than mine, and he regularly fills in some of the worst of the holes on the road. 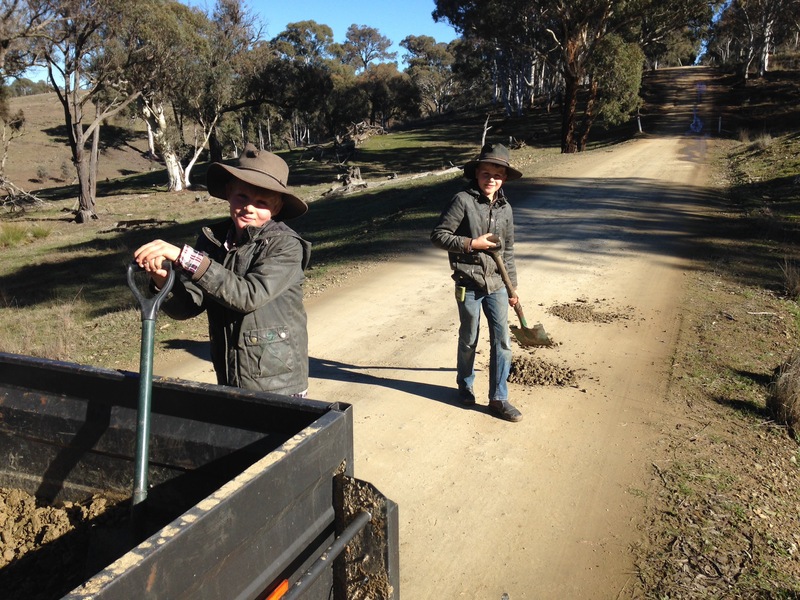 His efforts are very much appreciated by all of us, but it was time that the Little Helpers were recruited to bolster the road maintenance program. And they loved it. 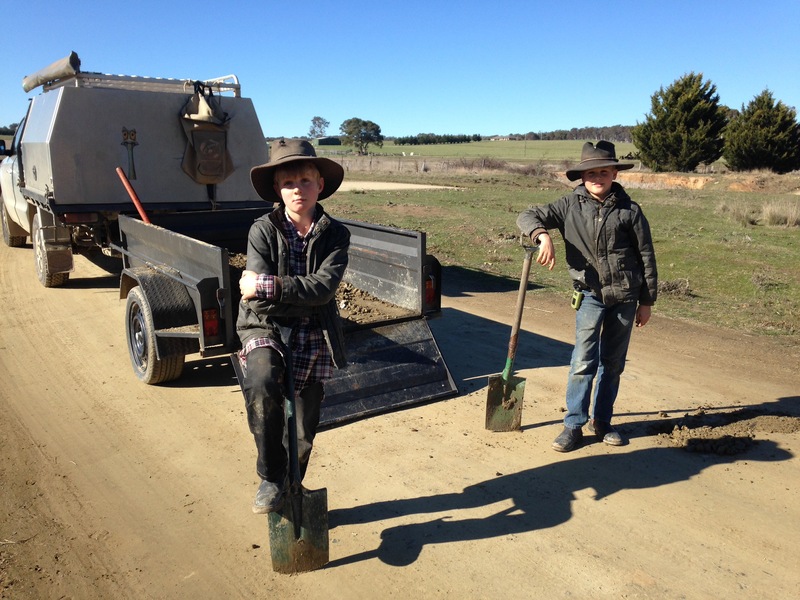 David kindly loaded our trailer with a bucket or two of great gravel, and we put the boys to work. After many years of making mud pies, and digging holes in all the wrong places, it was great to see their handiwork with a shovel extended to constructive projects too. They even decided they could take a moment to strike their ‘best Council Worker pose’. So how hard can changing a clutch be? Really? One of the joys about living on the Rock Farm is being miles from the hustle and bustle of modern day life. It is also one of its drawbacks, with round trips into the big city being at least a 100km journey. This means that our cars end up driving lots of kilometres each year. And eventually this catches up with you with a big maintenance bill. Eventually you get to a point where a car becomes uneconomic to repair, and you are forced to get a new(er) one. 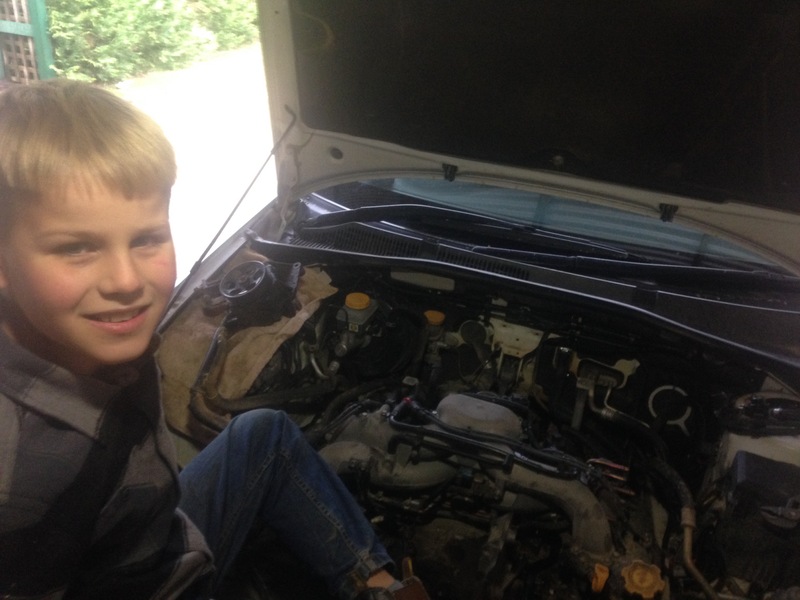 One of the ways we try to hold off this expensive option is to do some of the maintenance work on one of the cars ourselves. Now dropping the oil and kicking the tyres is one thing, but our little Subaru was starting to make all sorts of new groans and noises. Completely understandable after the past 270 000km of its life. So we were faced with a decision – repair or replace. A short walk around a few car yards made the decision easy. Repair was to be our choice. 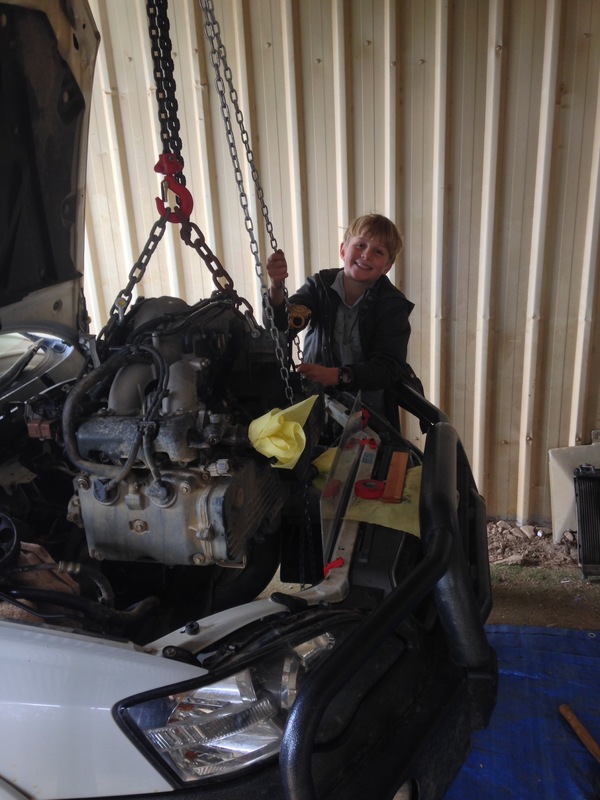 With our long term mechanic finally closing his doors a couple of years ago, we have been unable to settle on a mechanic. So I decided to give the job a go, myself – well not quite by myself – I did have a couple of little helpers. With YouTube research confirming any old hack can replace a clutch and replace the timing belt, I decided to give it a go. 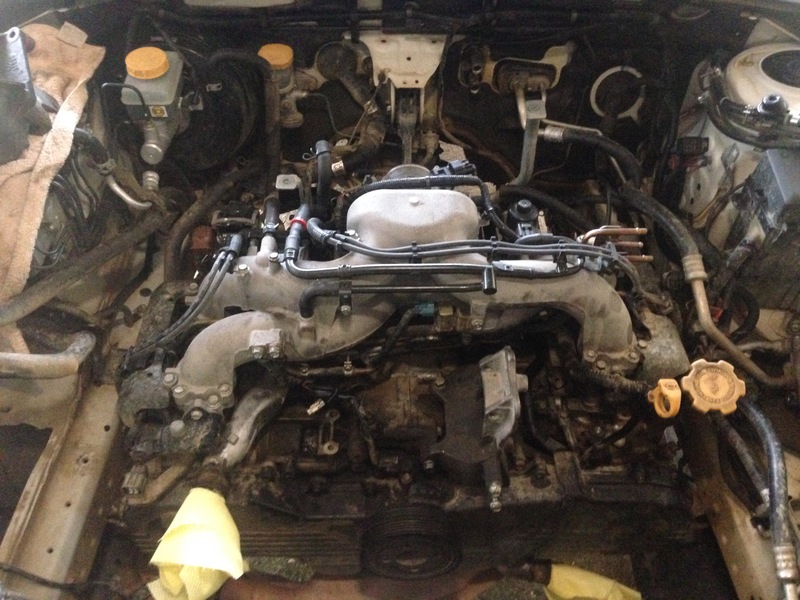 With parts alone amounting to over $1500 it wasn’t a gamble I really wanted to get wrong. An extra $75 for a workshop manual and another $99 for a chain block, it was time to swing the first spanner and give it a red hot go. And give it a go we did. The Little Helpers were fantastic, holding the light just right, for almost long enough before deciding to create interesting shadows on the wall. The intracies of the mechanical marvel that is the internal combustion engine might have been lost on them, but it was a good introduction that most mechanical machines can be maintained. Not all of them are disposable items in this consumer driven society. One of the advantages of this modern consumer scoiety however is the little camera that doubles as a phone. I was able to take lots of photos during the disassembly, which greatly aided the reverse process! I had a few nervous moments installing the new timing belt, with the explicit and direct warnings of the workshop manual burning into my brain that severe engine damage will occur if you get any part of this wrong. There is nothing like putting the cover back on and discovering there is a new pulley still sitting in the box! We also faced the problem that the water pump provided in the kit was from an earlier model and required a different flange for the radiator hose. The right bit cost $10 and half a day from a local wrecker). 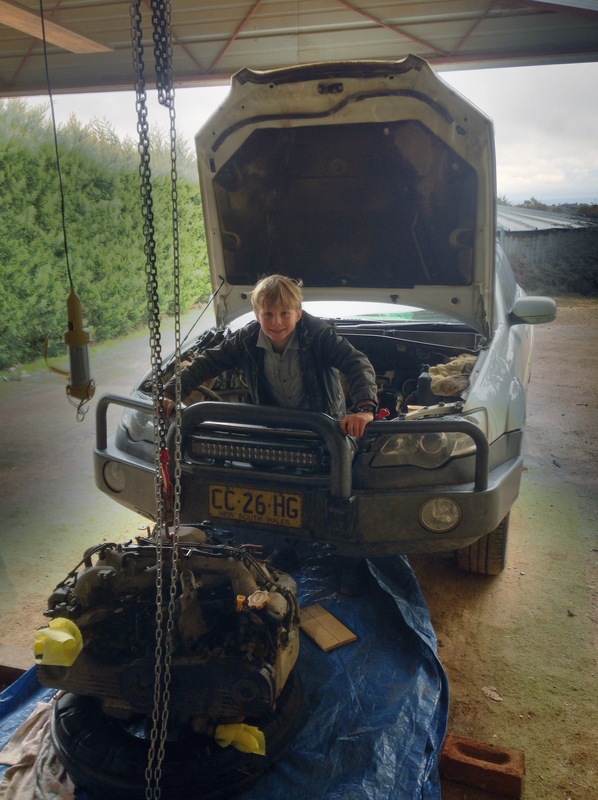 I considered replacing the whole engine with an exchange unit, however if I was going to go down that path, I would also replace the gearbox, radiator, alternator, and a whole heap of other bits and pieces. We would also need to re-bush the suspension, and so on. Mind you, as we went along, the Flintstone model (below) was looking mighty attractive! But it all went reasonably well. A friend lent me a magic 12 volt impact driver that made short work of the flywheel bolts and crankshaft pulley, without which the job would have been impossible. Putting it all together was another exercise in methodical and careful checking, but we got there in the end. The car started with an almighty screech from one of the drive belts, but a quick adjustment to the power steering pump soon fixed that and we were back on the road. All up it took about two and a half days – including the half day lost due to the trip to the wreckers. The result is definitely worth it. 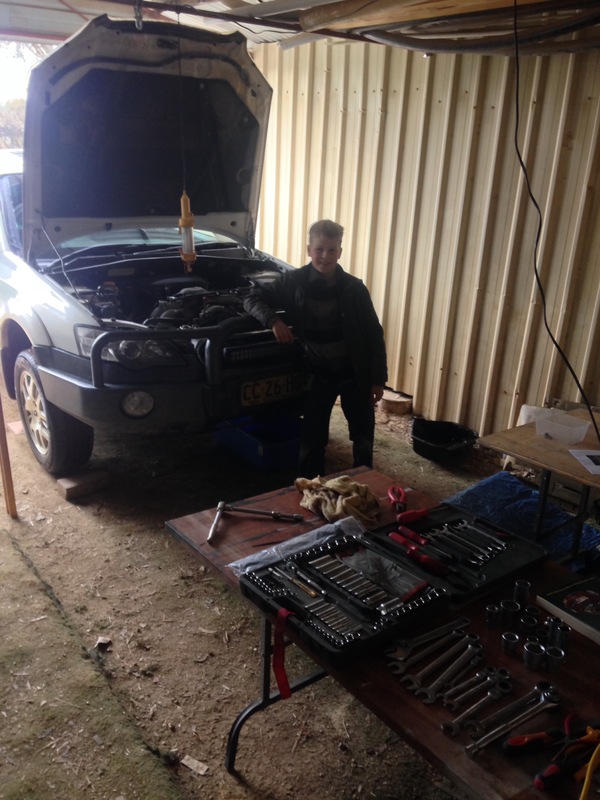 Thanks to Chris, Pa and the Little Helpers for their assistance during this exercise, and to Jo who managed to find the odd little tools and bits in town that made life a whole heap easier. Would I do it again? Hopefully not for another quarter of a million kilometers! One of the joys of living on a rural property is beautiful fresh rainwater stored in your own tank. The water tastes fresh, is free from chemical impurities and is deliciously soft. It is your water, and you can use as much or as little of it as you like. The consequences of your usage are yours alone to deal with. It is a wonderful part of living on your small farm. Until your pump dies. And then you need to get it fixed. Quickly. We were in a fortunate position that our pump gave us warning it was on the way out. It would fail to operate, and a simple reset by turning it off and on again would fix it. For a while at least. When the interval between resets became daily, it was time to take action. Davey Pumps were called, and their technical department were most helpful. They told me that the most likely culprit was the pressure switch in the controller. The type of controller we had fitted hadn’t been made in around 20 years, giving us some indication of the age of the pump. I was advised to take the pump to a repair agent, where the pump could be bench tested. One phone call later, and the pump was booked in the following morning for a thorough inspection. The pump was easy enough to remove. 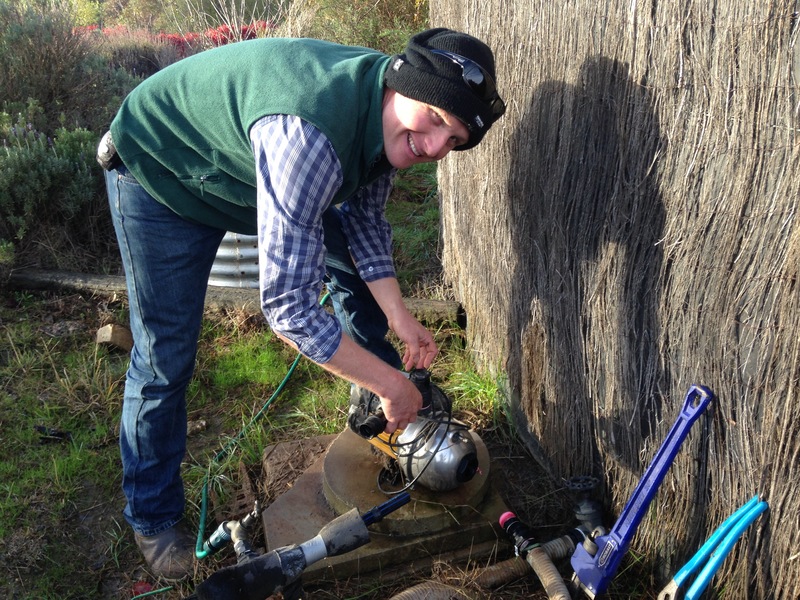 The worst bit was the cold fingers on the chilly morning easing the pipe fittings from the pump. And in no time at all, the pump was in a tub on its way to town for inspection. After a few hours, I was told that the pump itself was in good condition, however the controller was indeed stuffed. Thankfully the new controllers are compatible with the older pumps, meaning we were able to fit the new controller. A few minutes work and some new plumbing tape and the pump was reinstalled and working a charm. 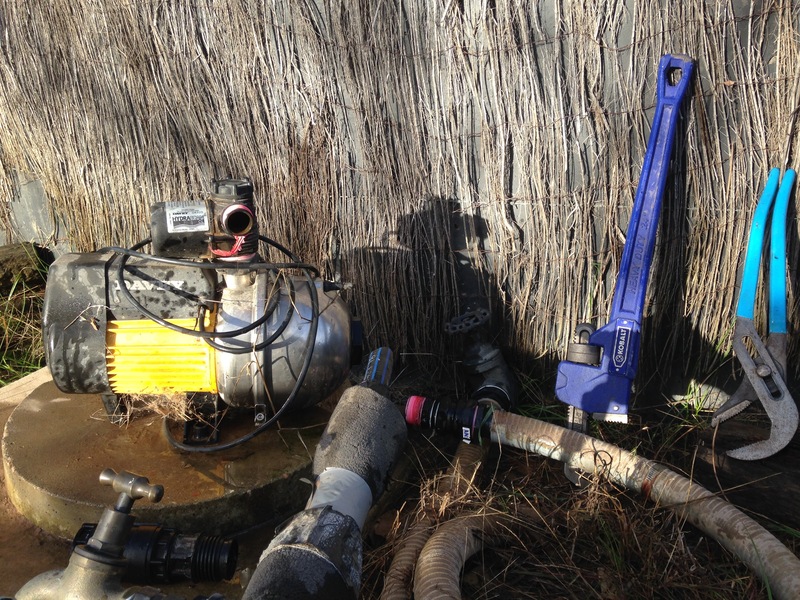 This little process taught me the value of buying a quality Australian made pump, particularly for critical components such as house water. The service and support offered was excellent, and instead of buying a complete replacement unit, I was able to save a small fortune by buying just the component I needed.